The thought of travel to Bhutan had been lingering in my head for many years before Nikki and I actually made it there. I found it difficult to justify spending the same amount of money on a short visit to the mysterious kingdom where tobacco is prohibited, as I would spend in a few months of travel in Southeast Asia or in India. Up until then, we had opted for destinations which made more budgetary sense, until curiosity finally got the better of us and we decided that whatever the cost, it was time for us to travel to Bhutan. Bhutan offers some of the best views! We always promote independent traveling, without the need of an organised tour, but if you have difficulty planning your own trip, or you are short on time, we suggest that you take a look at the trips by Viator and G Adventures. Once I had read every Bhutan article and blog post available online (which weren’t too many), I set about planning our trip for travel to Bhutan. First up was deciding how long to stay for and which part of the country to travel to. The cost of a trip to Bhutan needs to include the Minimum Daily Package which is a fee set by the Royal Government of Bhutan. At 250 USD per person per night, it is not exactly backpacker-friendly and the length of your trip will probably depend a lot on how much you wish to spend. 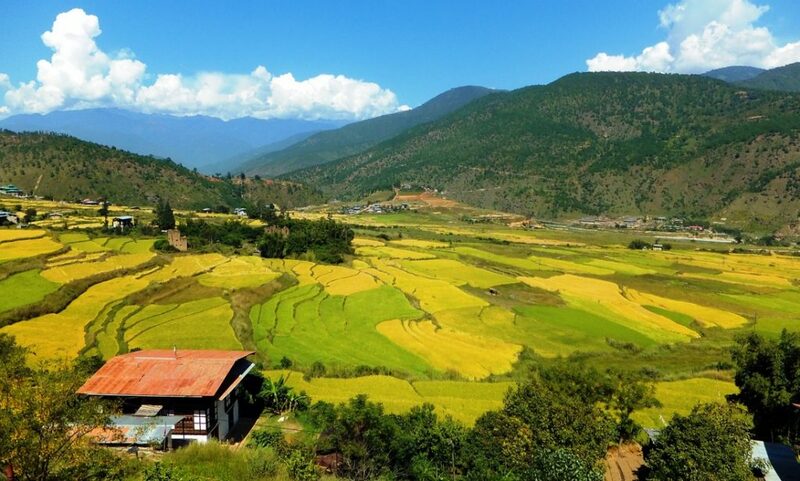 It is important to consider however that this daily package fee will cover all your needs in Bhutan including accommodation, food, transport, and a licensed guide. It also includes a royalty of 65 USD which goes towards social benefits, such as education and healthcare. This is still far more than we would normally spend when travelling but it is in line with Bhutan’s tourism policy of sustainable, high value, low impact tourism. We decided to stay for twelve nights and we were asked to pay the total sum to the the Tourism Council of Bhutan via the Bhutan National Bank before arrival. The funds cannot be sent direct to Bhutan so they have to be routed via an intermediary bank that will forward the funds to Bhutan. This may sound a little daunting but the tour operator normally provides instructions regarding all procedures necessary to travel to Bhutan. 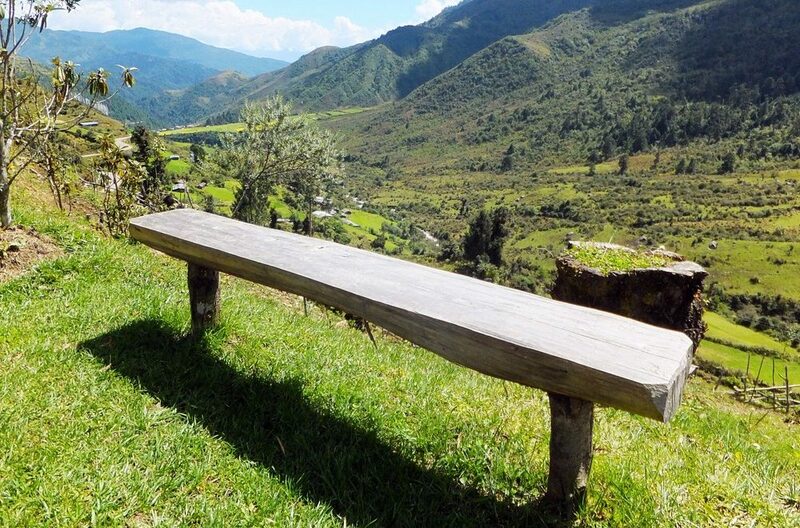 It is not possible to travel to Bhutan (and around) independently, although this should not be considered a totalitarian obligation but rather an interest into your well being during your stay. Travel to Bhutan needs to be organised by a tour operator and backpackers are actually discouraged from travelling to the country. This of course is very annoying to those used to planning and organizing their own trips, and is one of the limitations of travelling to the kingdom, however the relatively good news is that you can draw up your own itinerary with considerable liberty. 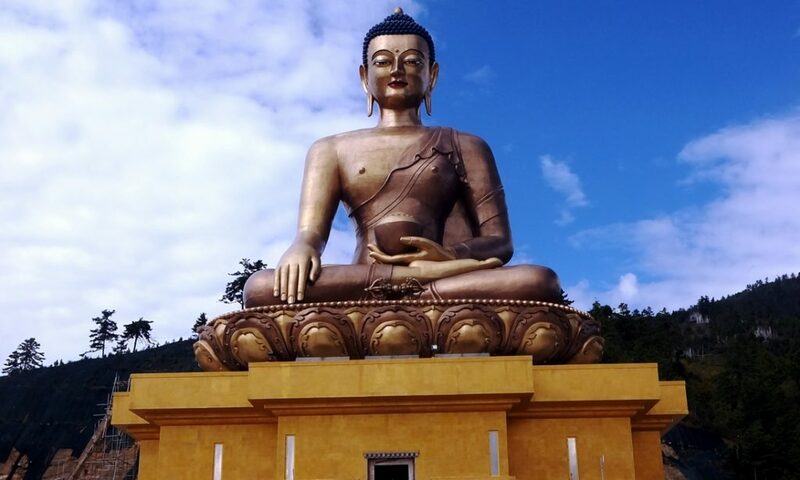 So once we had determined where we wanted to go and what we wanted to do, we asked a well reviewed tour operator based in Bhutan to look into our itinerary for travel to Bhutan. They got back to us very quickly and confirmed that our itinerary was possible; we would have a guide, car and driver available at all times and they would book our accommodation in 3* hotels – different, better quality hotels can be booked at a surcharge. Essentially we would not need to spend more than the Minimum Daily Package and any other “extras” such as a beer now and then. Eventually the cost of the “extras” was less 5 USD per person per day. Water during the trip was also provided by the tour operator. A comprehensive list of licensed tour operators is available on the Tourism Council of Bhutan’s website. This is arranged by the tour operator for all those planning to travel to Bhutan, except for citizens of India, Bangladesh and Maldives who can obtain a visa on arrival. Visa clearance letters are usually issued within the month prior to arrival and only after full payment of the Minimum Daily Package to the Tourism Council of Bhutan has been made. Cost of visa is 50 USD and the actual visa is then stamped onto the passport upon entry to the country. Onward travel to Bhutan can be daunting. Flights for travel to Bhutan are booked by the tour operator. Arranging flights in and out of Bhutan at short notice is next to impossible and flights are usually booked months ahead, so our tour operator booked us on as soon as we showed interest in the trip (about six months prior) and assured us that they can be cancelled at no additional cost. However they had to be paid in full three months before our arrival so as to secure the booking, although 75% of the cost could be refunded up until 30 days before the trip in case of eventual cancellation. Druk Air, Bhutan’s national carrier, flies to India, Thailand, Nepal, Singapore and Bangladesh. Happy after finally having landed in Bhutan! We initially planned to fly in and out of New Delhi but due to a random series of events and little diplomatic help, our passports got lost when applying for a visa for India. This little snag made our travel to Bhutan a little more complex. After obtaining new passports and realising that we were not in time to apply for another visa for India, we tried connecting in Bangkok instead but the ingoing flight was already fully booked! Our only option was to retain our flight through Delhi (without holding a visa) however this meant that we could not pass through immigration to collect our luggage in India. 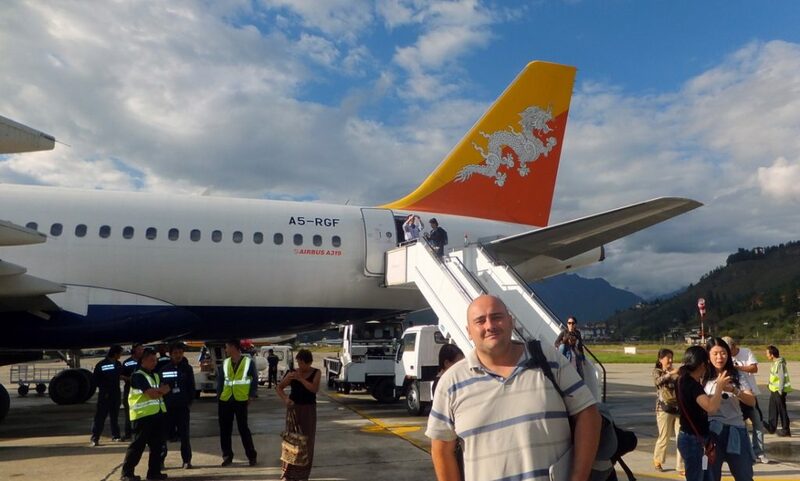 As Druk Air had no baggage transfer agreement with our connecting airline, it was not possible to have our bags checked straight through to Bhutan – quite a pickle we found ourselves in! One option was to travel to Bhutan with carry-on luggage only but luckily we found a better solution. We were told that the staff working at the hotel located within the transit area at the New Delhi Airport would arrange to collect our bags from our incoming flight and check them on the Druk Air flight if we booked a few hours stay in the hotel during our transit period – and that is exactly what happened. We were pretty much prepared to arrive in Bhutan minus luggage, so it was with great surprise that we saw our bags being hauled inside Bhutan airport’s terminal building! Flights in and out of Bhutan are pretty expensive – we paid about 700 USD per person for flights from New Delhi to Paro and out of Paro to Bangkok! Bhutan can be divided in Western Bhutan, Central Bhutan and Eastern Bhutan. The only international airport is in the western part, this being the region most visited by those who travel to Bhutan, especially those with short itineraries. Because we were travelling for 12 days, we had enough time to visit the western part and the central part – visiting the eastern part would require a longer (and much more expensive) stay. Keep this in mind when planning your travel to Bhutan. 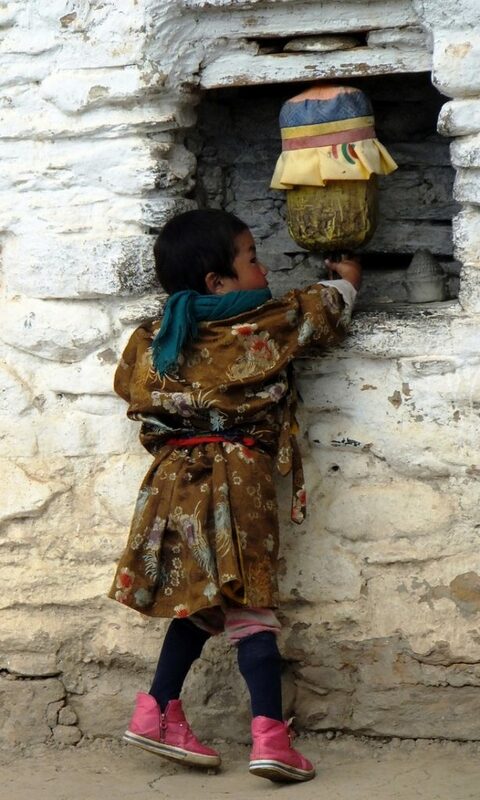 After some research we decided on the following itinerary: Paro – Thimpu – Punakha – Bumthang – Gangtey – Thimpu – Paro. We used Bumthang as a base for Central Bhutan and spent four days exploring the valley and around it. Most villages in Bhutan organise very colourful festivals and it was important to us that our travel to Bhutan coincided with at least one festival. We also requested to spend some time in a typical, rustic Bhutanese home with local villagers which the tour operator arranged for us. We would have preferred to have had more freedom in organising our travel to Bhutan, and the thought of having a driver and guide at all times as opposed to making our own way around, was initially very off-putting. We made friends with Ugyen our guide and Dechen our driver on the first day and after several conversations related to their country, we quickly realised that without them we would never have gained a true insight into the way of life and culture of Bhutanese people in such a short while. Thank you guys! The expense of travel to Bhutan is daunting and there isn’t much of pro to this except that the country is not invaded with uninterested tourists who have little or no knowledge of the country they are visiting. 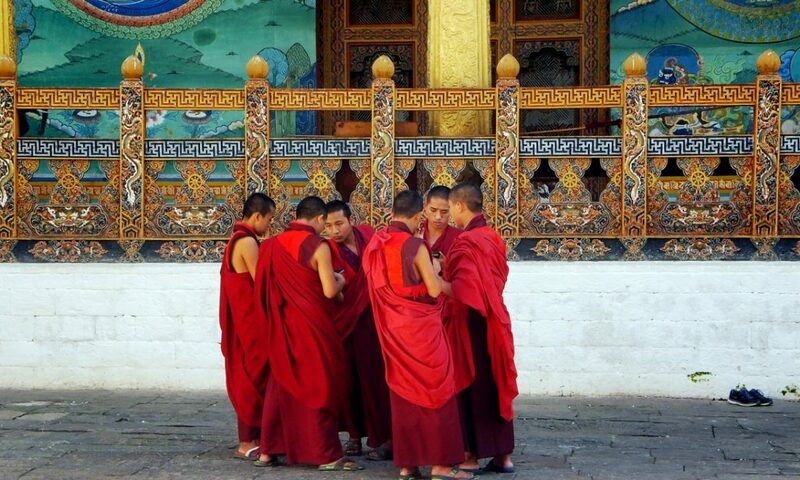 Most tourists travel to Bhutan because they have made an informed decision in choosing to travel to the country as opposed to cheaper destinations and often have special interest in local or cultural practices. The trip proved to be much more comfortable in terms of transport and accommodation when compared to our usual style of travelling, so no complaints there! Flights to Bhutan are fully booked several months ahead so trips cannot be organised on the spur of the moment although it is also possible to travel to Bhutan from India via the land border. Plan ahead when travelling to Bhutan! Food is best described as boring. When a country’s national dish is spicy chilis smothered in a cheese sauce you might be forgiven in thinking that you are in for some exciting food experiences. Because the Bhutanese are so hospitable however, they seem to have put together a menu especially for foreigners, who in their opinion cannot handle the local chili-based cuisine (they are mostly correct). Lunches and dinners are invariably buffets of chinese-style chicken, rice and vegetable dishes which we got tired of very quickly. Requests for authentic local food in restaurants seemed to worry the restaurant staff to no end, who firmly but gently always turned us down, but we did manage to get the real deal when we stopped for lunch in farmhouses and at homestays. 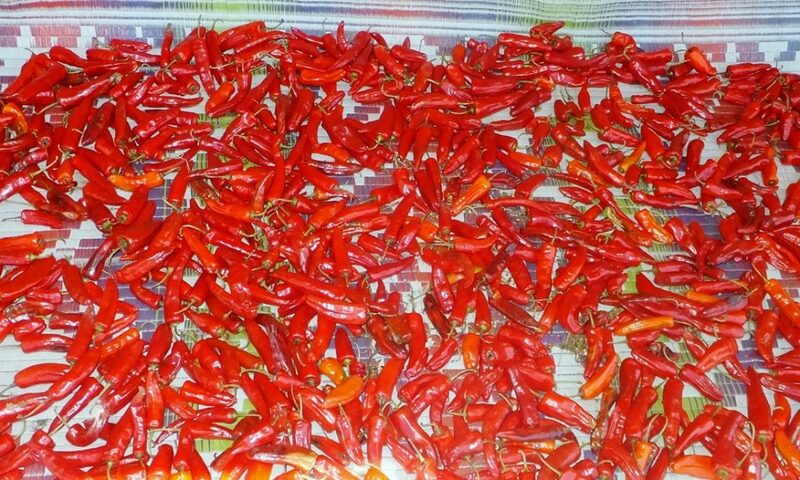 We assured our hosts that we could take the heat but quickly discovered the true laxative potential of Bhutanese chilis. The biggest pro of travel to Bhutan is experiencing the pristine beauty of a country as yet untouched by globalisation and the great warmth of its happy people.